To learn more about Trazodone and understand the side effects of Trazodone, you have to understand the drug itself. Trazodone is a class of antidepressant known as a serotonin modulator. Taken orally, the drug controls levels of serotonin in the brain to help prevent depressive episodes. Physicians believe that it is the imbalance of serotonin levels that causes emotional disorders like depression. More serotonin stimulates the nerves, which may lead to a more positive mood. The medication may also be used to control anxiety and schizophrenia. Because depression and other emotional disorders do not affect individuals the same way, Trazodone has proven to be a versatile drug for adapting to variations in individual patients, especially those with dynamic shifts in serotonin levels. However, there are side effects to the drug. Trazodone is also available as a generic drug and must be prescribed by a physician. Is Trazodone effective for all forms of depression? Because depression is based on the individual, Trazodone may or may not work. Individual use may yield very positive results or none. Doctors must determine if the negative side effects of Trazodone are also worth the positive impact on the mental condition of the patient. Large doses have been used in extreme cases of mental illness such as schizophrenia and psychosis and just as easily, doctors have prescribed small manageable doses to others handling minor forms of depression. Again, individual experience varies and so it becomes the patient’s own experience which decides the effectiveness of the drug. What are some of the most common side effects reported with Trazodone? Trazodone typically causes drowsiness and dizziness in patients. There are also reports of the drug causing constipation and blurry vision. Headaches are common, along with nausea and sometimes vomiting. Aching muscles, dry mouth and a ringing in the ears are also common side effects reported. Unusual bleeding and bruising have been reported with the use of Trazodone along with an accelerated heartbeat. Behaviorally and emotionally, Trazodone may cause irritability and a general feeling of restlessness and sometimes aggressive behavior. Even hallucinations have been reported. In some cases, thoughts of suicide have occurred while using Trazodone. Will Trazodone make me too tired to do anything? Initially, the dose of Trazodone given to you by your doctor may make you feel excessive dizziness and drowsiness. Over time, tolerance builds, and you may be able to function normally without feeling these symptoms. The dose of the drug must be monitored by the prescribing doctor to determine the right amount to make an individual feel comfortable, coherent and aware. Communicating to the doctor about extreme symptoms of lost coordination or sleepiness can be helped by simply changing the dose. Also, abuse of the drug can lead to excessive fatigue as well. Taking Trazodone in large doses and with alcohol or with other drugs can all lead to fainting, excessive sleep and even a coma. Are there risks of Trazodone use with children and teenagers? Research has shown that there is a slightly increased risk for suicidal behavior in both children and teens using Trazodone. About four percent of children and teens prescribed the drug exhibited suicidal thoughts or behaviors. Though depression itself is a factor in suicidal behavior, the clinical research suggests that physicians and family should carefully monitor children and teens who have been prescribed Trazodone to watch for unusual behavior. Other side effects noticed in both children and teens was strange changes in mood and behavior, excessive talking and activity and a tendency for dangerous impulses. What are effects of Trazodone on the elderly? The most common side effects for elderly patients using Trazodone are medically-related issues. Kidney function can sometimes be compromised with regular Trazodone use. Because of the slower metabolism of elderly patients, the medication may take longer to produce results. Other medical side effects may include a reduction in salt levels in the blood. Eye conditions, including a form of glaucoma called angle closure glaucoma have been reported. Should Trazodone be prescribed to dementia patients? Dementia patients may be experiencing anxiety and depression as their mental condition weakens. Trazodone is a safe medicine for helping dementia patients feel better. The treatment has been known to help dementia patients with sleep disorders as well. Often dementia patients will have difficulty falling asleep or experience frequent wakening at night, waking too early or sleeping too much during the day. Trazodone has been found to help create more even patterned sleep regiments among dementia patients. What are the long-term side effects? There are risks of dependency with Trazodone. The longer a patient takes Trazodone, the more likely an addiction may develop. Trazadone produces a high when taken beyond prescribed doses which can increase the risk for addiction. Long-term Trazodone may affect memory functions and learning and thinking abilities. If there are signs of withdrawal symptoms including cravings for the drug or attempts to take more than prescribed when Trazodone use is discontinued, then a physician must treat the condition as an addiction. Can you overdose on Trazodone? Overdose most commonly occurs among those abusing the drug. However, there are instances where doses beyond the prescribed amount were accidentally taken. Overdose symptoms include excessive drowsiness to the point that the patient may slip into a coma. Dizziness, which is a common side effect, may increase to the point of lack of coordination and the patient falling. A patient overdosing on Trazodone may also faint from the irregular heartbeat caused by the drug. An increased shortness of breath and even the cessation of breathing may occur during an overdose. What is serotonin syndrome and how does Trazodone impact the condition? Serotonin syndrome is the result of too much serotonin in the body. Misuse or overuse of Trazodone can cause this condition in some instances. Also using Trazodone in combination with other antidepressants can lead to serotonin syndrome. Symptoms of serotonin syndrome include muscle rigidity, fever and seizures. The condition can be potentially life-threatening. Because of this risk it is critical for physicians prescribing Trazodone to begin with low doses of the medication and careful monitoring of the patient’s health. Gradual increases in dosage can begin once an ideal balance of serotonin levels has been determined. It is also important that anyone taking the medication be careful not to consciously increase dosage on their own. For elderly patients who may accidentally take too much, controlled dosing may be required. 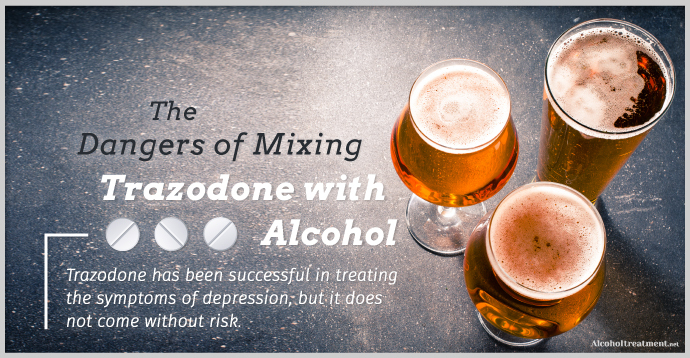 What happens when Trazodone is mixed with alcohol? Overall, alcohol should never be mixed with prescription medication. This fact becomes far worse when alcohol is mixed with Trazadone. The two drugs together can decrease motor skills leading to falls and accidents. The combination enhances drowsiness and dizziness, which are the known side of effects of Trazodone. The combination of the two can also cause dramatic mood swings, poor judgement and increases in feelings of depression and anxiety. What other medications can cause issues when used with Trazodone? Along with alcohol, many other drugs should be avoided when using Trazodone. Certainly, other antidepressants need to be monitored when combined with Trazodone. Drugs for mental illness like Prozac and Luvox can cause serotonin syndrome if not carefully prescribed by the physician. For many with heart problems, combining blood thinners with Trazodone many cause heart irregularities. This applies to even minor blood thinner medications like aspirin and ibuprofen. Drugs used for managing HIV/AIDS can also be harmful when used along with Trazadone. They may cause side effects including low blood pressure and nausea. In addition, cold, cough and allergy medications and medications for treating fungal diseases may all lead to adverse reactions when used in conjunction with Trazodone. How does Trazadone compare with Klonopin? The two drugs Trazadone and Klonopin are both options for patients suffering from depression. How they impact the individual is usually a trial and error process refined by the prescribing physician to see what works best for the patient and which drug produces the least number of adverse side effects. Overall, Trazadone has been found to have fewer side effects than Klonopin. Klonopin is more likely to be abused than Trazadone and his considered a controlled substance in the US. The two drugs can never be taken together. In studies with patients it has also been found that Trazadone is less likely to impair thinking and coordination if used properly and as prescribed. For this reason, Trazadone is often preferred for long-term treatment. Is weight gain a side effect of Trazadone? There have been significant studies connecting weight gain with Trazadone use. In one study, Trazadone use over a six-week period led to an average gain of 1.2 pounds. Researchers suspect that the sedation effects of Trazadone are to blame, as patients neglect exercise and reduce their everyday movements. Of course, Trazadone also has an impact on the body’s physiology, including a change in appetite and a slowed metabolism. Patients have experienced an increase in appetite, especially craving carbohydrates which can cause dramatic weight gain. Scientists have found a link between serotonin increases and carbohydrate intake. Some researchers have suggested that the body’s fat-storage systems are altered while taking Trazadone. Hormone level increases as well can be thrown off-balance with regular Trazadone use, which can cause excess fat storage in the body. Others have theorized that the increase in weight is directly connected to an increase in appetite because the drug has worked! Depression leads to loss of appetite and as a positive mood increases so does the desire and appreciation of food. Should you take Trazodone for insomnia? Trazadone is often prescribed for sleep disorders like insomnia. Because in-balances in serotonin are often the cause of insomnia, Trazodone has become an ideal medication for treating the condition. Its sedative effects offer insomnia sufferers a calming effect for a peaceful night’s rest. The downside is that Trazadone can lose its effectiveness fairly quickly. So for long-term insomnia, Trazadone may eventually cease to work. To better understand how Trazadone should be used, requires a deeper understanding of the different levels of insomnia as a condition. Onset insomnia is essentially difficulty falling asleep. Trazodone can offer the proper sedation to overcome this issue, which is usually caused by stress and anxiety. Middle insomnia is trouble staying asleep. Those suffering with middle insomnia may go to sleep quickly but wake up a few hours later. Here again, Trazadone is helpful as it maintains a sedated condition that keeps insomniacs sound asleep through their most difficult period. In both instances it is Trazadone’s three to six-hour half-life that makes it an effective drug. Late insomnia, or chronic early waking, is not as easily treated with Trazadone. Other sleep aids may be more beneficial for this sleep disorder. In comparison, however, to other sleep aids such as Ambien, Trazadone has proven to be the preferred remedy. Ambien has too many side effects and may also cause sleepwalking, compared to a few side effects with Trazadone. In all instances, a physician should be consulted before Trazadone is taken as a sleep aid. When doctors begin overprescribing the drug or the drug is used in conjunction with alcohol or other drugs, then Trazodone no longer becomes a medication but an abused substance. If use of the drug is unsupervised, it is easy for some patients to develop a dependency, build a tolerance and find ways to enhance their high using Trazodone with other substances. That’s why it is very important to keep Trazodone away for children and teenagers who may attempt to use the drug for recreational purposes. How do you taper off Trazadone? How long the drug has been taken and the size of the dose are all factors that impact the severity of Trazadone dependency. With doses over 600 milligrams, halting regular Trazadone use may become difficult. Cold turkey is not recommended as it can shock the nervous system and cause more severe withdrawal symptoms. Gradually reducing the dose of the drug over time can lead to complete abstinence. Keeping a calendar of reduced dosages and adhering to the calendar both motivates the goal of no longer using the drug as well as keeps users on track for meeting those goals. What is the typical dosage for Trazadone? Doses vary for every patient. But typically for depression treatment Trazadone should be administered at 150 milligrams a day. The prescribing physician, based on monitored results, may increase that dosage to fifty milligrams a day. For children and teens dosage should be limited to twenty-five to fifty milligrams a day and adjusted as necessary based on physician monitoring. For elderly patients, immediate release Trazadone should be administered at twenty-five to fifty milligrams. Discussing dosage with your doctor is critical to getting the best treatment. Even a qualified physician will never know exactly how a medication impacts your life. Communicate with your physician to change the dose to fit your lifestyle. What medical issues should be discussed with a doctor before taking Trazodone? Trazadone side effects and effectiveness should be discussed with a physician before using. Medical issues should be disclosed including heart problems, issues with low or high blood pressure, a history of drug or alcohol abuse, cancer, anemia, kidney problems, liver problems, and a history of mental disorders and a list of medications taken to treat them. Trazadone has been known to cause accelerated heart rates and arrythmia, which is why it needs to be taken with caution when heart problems are present. Blood pressure fluctuations with Trazadone have also been reported, so blood pressure issues and anemia can complicate the use of the drug. Because drugs and alcohol can have adverse reactions when combined with Trazadone, it is important to reveal to a physician any past drug or alcohol problems. Cancer treatment drugs can have adverse reactions with Trazadone as well, so any cancer treatment needs to be known by the prescribing physician. Like any prescription drug, Trazadone can also affect the liver and kidneys and pre-existing problems must be understood before the drug can be prescribed. Because of the risk of serotine syndrome and other interaction illnesses associated with drugs prescribed for mental disorders, they need to be known to the prescribing doctor to prevent serious side effects when using Trazadone. Is Trazadone safe during pregnancy? The facts are not all clear on whether Trazadone is safe for pregnant women. There is currently no evidence that Trazodone use can increase the risk for miscarriage, stillbirth or low birth weight of the baby. Yet, there are concerns that the dependency of Trazadone may impact the child at birth, leading to withdrawal symptoms. Because all medications taken by the birth mother enter the placenta, any medication a mother takes, is also the medication her child is taking. Physicians may advise reducing the use of Trazadone during pregnancy or at least monitor the health of the mother and child while Trazadone is being taken. Preferably the birth mother should try to wean off of Trazadone during the first trimester. This is the time when the baby is developing and is at highest risk for disorders. Under a doctor’s scrutiny, a pregnant woman may then resume Trazodone during the second trimester when the risk for development disorders has reduced, although the doses should be lower than when the woman was not pregnant. How long does it take for Trazodone to start working? The effects of Trazadone peak in the blood about two hours after ingestion. However, it may take two to four weeks to feel the full effects of the medication. When do the effects of Trazodone wear off? For patients using Trazadone as a sleep aid, the effects may last about one to three hours. For depression patients, the effects of Trazadone may take weeks before the absence of the medication can make a difference. Trazadone has been used to treat anxiety. The drug is often used with patients experiencing a combination of anxiety and depression. Often Trazodone is used in place of drugs like benzodiazepines. A physician will usually start with the smallest dose and then slowly increase the dose to manage anxiety issues. Trazodone may also be helpful for particular anxiety conditions such as social anxiety. In most cases, it is difficult to tell of Trazodone specifically caused a death. Often overdoses are associated with suicide, which is inconclusive. However, when combined with other drugs or alcohol there is a risk of overdose when used in large doses not prescribed by a doctor. What other conditions is Trazadone prescribed for? Trazodone is primarily an antidepressant medication. However, it has been prescribed for panic disorder, fibromyalgia, Bulimia nervosa, diabetic neuropathy, alcohol abuse withdrawal, obsessive compulsive disorder, schizophrenia and psychosis. What are the alternatives to Trazodone? Though there are numerous other antidepressant medications on the market that can replace Trazodone, the best option might be to choose non-medical therapies. Consider the following for treating depression. Psychotherapy can help manage depressive episodes without medication. Leaning to cope drug-free can make a difference in your health and life. With ten to twenty short term sessions, many patients find they can overcome depression without medications. Natural therapies are often used instead of commercial pharmaceuticals and include a healthy, well-balanced diet, the use of probiotics, exercise and more time spent outdoors. Often natural therapies can boost serotonin naturally and without the potential risks of drugs. If no other therapies are viable, there are other medications that can help if Trazodone does not work. Selective serotine reuptake inhibitors or SSRIs, serotonin norepinephrine reuptake inhibitors and monoamine oxidase inhibitors are all options for depression management that are available through a physician. Why should anyone with depression take a drug that may induce suicidal thoughts? The risk of suicide is minimal with Trazodone. In many cases, the severity of the patient’s depression is extreme or in some cases, the dosage prescribed was too low to prevent extreme behavior. On average, there has been no proven cases where Trazodone has been directly connected with the suicide of a patient.